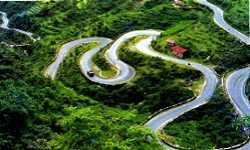 Mussoorie Tour Packages : Mussoorie is a Hillstation about 34 km from Dehradun and in Dehradun district in the Indian state of Uttarakhand. It is situated in the foothills of the Himalaya ranges, is also known as the Queen of the Hills. The adjoining town of Landour, which includes a military cantonment, is considered part of 'greater Mussoorie', as are the townships of Barlowganj and Jharipani. Being at an average altitude of 2,000 meters (6,600 ft), Mussoorie, with its green hills and varied flora and fauna, is a fascinating hill resort. Commanding snow ranges to the north-east, and glittering views of the Doon Valley and Shiwalik ranges in the south, the town was once said to present a 'fairyland' atmosphere to tourists. The highest point is lal tibba with a height of over 7000ft. 16 July to 30 Nov, 6 Jan to 31 March. •	Welcome Drink and Fruit Basket on arrival. If you have you own idea, liking or want to visit any Place in Punjab or India, do write to us and we will organize all the travel services for you.